Last weekend, three of friends joined me for service. Never would I have imagined standing with my friends in the House of God! These were friends from my delinquent days. 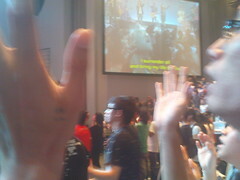 In the past, we grew up fighting side by side, but now we were standing side by side worshiping God with lifted hands! Wow… God is pretty amazing! After eight years of praying, ‘sowing’ and waiting, He is showing me what He has been doing behind the scenes all this while. It is so awesome to see one by one of them reconciling to Him! But I know there are still much left to be done. In the meantime, I am really excited about the other surprises God has under His sleeves for me for the rest of this year. Whoa! THat’s really powerful! Really encouraged to hear how your persistent sowing and trust in the Lord is paying off, with the impact and difference made in your friends lives… continue to stand firm and jia you the good fight, bro !